Fun on a budget - oh yeh. Cheap pit bikes have been around for some time in one shape or another. Commonly known as a dirt bike or just dirt track motorbike. But now the true pit bike is smaller and more powerful than ever before. These cheap bikes are proper bikes for adults too, and the speed that they can reach is phenomenal for their size. Fans are all over the world, due to the superb low cost of such items and the interest in all the accessories that accompany this type of two wheeled past-time. Buy your brilliant pit bikes for a whole new experience. 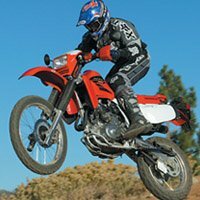 We decided to look for some good cheap pit bikes and see what’s around online. Some of the best pit bikes don’t have to be expensive, and often used motocross bikes have lots of life left in them, and a lower cost to you. Best place to begin is with cheap dirtbikes, and we had a look at the website cokermoto.com, which has an A M Pit 50cc bike for sale at £235. Its one of the new pit bikes for next year, incorporating a re-enforced 10 inch wheel, uses a genuine 50cc capacity engine, (other engines advertised as 50cc, can be below par). Plus an adjustable rear shock absorber, upside Front Forks and an extended rear swing arm. No gears, just point and go, and an alloy pull Starter. Safety is greatly enhanced too, with reinforced brake levers, wavy disc brakes and restrictable throttle - so this model goes on our cheap pit bikes list. Cokermoto.com also offers the DX110 DEMON MK3 for sale. At a price tag of £359.99 (sale price), it’s a slightly higher spec’d bike with more durable parts. The advantage of this ride is that it can be easily upgraded to a 140cc in the way it is designed, as it shares many parts of the DYX 140cc. This new dirtbikes model is advertised as the UK's top selling Pit Bike and with a Lifan MS engine which has been described as being extremely reliable and bullet proof its an exceptional buy, but as we know sale prices don’t last all that long. Now what about cheap motocross bikes on ebay, I hear you cry - well try this a 250cc Dirt Bike model called a KXD 250R Motocross Pit Bike. At £799.99 it is more expensive than the two mini bikes we discussed above, but it is new and has plenty of options. For a start it kicks out 17 HP so will carry you at 70 MPH! A unique KXD frame, big bore BBR thumper exhaust and a Mikuni Carb gives this a good presence on the dirt track. Plus it carries upside down oil filled forks, Pro-link style rear suspension and twin pot brake calipers. There’s even more to list such as an Adjustable Rear Shock, High Strength Gold Chain etc etc, so for the price this new scrambler bike impressed us. 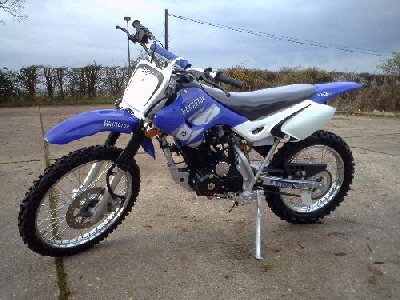 Seeking cheap pit bikes on Ebay also turned up the NEW Dirt Trac 125cc pit bike, Moto X model for £399. This new ride has a Zongshen 125cc, 2 Valve, 4 stroke air cooled engine, and a Cdi Ignition. Front and rear disk brakes with a four speed transmission. Wheelbase is 1160mm on this model, but the advert does state some assembly is required, but the store can assemble it for you at an extra cost of £40. Depending on your skill level, and the cheap price of the motocross bike – if your not confident with putting a dirtbike together let an expert do it, cheap pit bikes dont have to be hard work. After the bargains on ebay for cheap pit bikes we took a peek at f1products.co.uk. We immediately saw a KT125cc Off Road Dirt Bike / Scrambler pit bike. Now this bike does require assembly, but they include the tools in the box. The price was only £599.00 inc. VAT, with CDI ignition and a top speed of 50KPH, it doesn’t seem a bad bike. Descriptions on the bikes were a little sparse and we would have liked a bit more information before parting with our cash, but we liked the sound of this bike and dirt bike images were clear and acceptable. Now the prices get even better on used pitbikes for instance would you like a 2007 xplorer 125 pit bike at a starting bid £170.00 ? Well the many auction sites out there offer such a price. Remember too that there are many other auction websites other than ebay, so do explore them – you have less competition on final prices. Taking a trip over to www.ukclassifieds.co.uk for used scramblers, used dirtbikes and cheap pit bikes we stumbled upon, a cheap kids dirt bike called an - XB Monster for £349 with a 125cc motor. Advertised as fast and strong, with good reliability. The bike should be able to deliver on small jumps and is recommended for ages 12 – adults. Engine is 1-cylinder, 4-Stroke unit with CDI Ignition, four speed transmission and kick start. Max power came in at 100 km/h, and looking closer at the advert, it looked like a new bike not a used one! We think in this case a trader was selling overstocked items during a seasonal sale, even though this site is a common place for used deals. Great value for us, and from a reliable vendor too. Now for a cheap pit bikes present you can’t beat this over at mypurerush.com we spotted a nice deal. An Akuma 125cc Pit Bike, Helmet, Goggles, Fox Knee and Elbow Pads & Gloves all in for - £ 470. Yes we weren’t sure too, as that’s quite a lot of stuff for the money. But It was an Akuma Assassin 125cc Pit Bike (with a 4 Stroke Lifan Engine) Mikuni carburetor and a fully adjustable rear gas shock. Engine is a 2-valve, 1-cylinder, air-cooled, 4-stroke and has all the normal features you’d expect on a dirt bike. The clothing included an MX Helmet Light Weight 6-point ventilation ECER22-05 Certified. With some strong MX Goggles (Anti Fog). A pair of MX Enduro Gloves with some Fox Knee and Elbow Pads ( Official Fox Racing Product Ultra Light Weight & CE Approved). So not only cheap dirt bikes, but most of the gear thrown in as well, you can’t beat that. Low-cost racing pit bikes can be found on ebay and on other used classified ads. When selecting your motor be sure the pit bike performance you require is there. 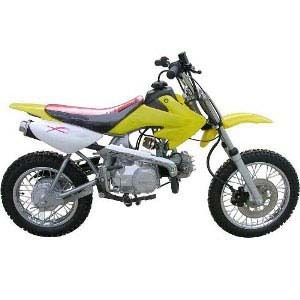 A pit bike motorcycle is a superb machine but take time in your choice and cheap pit bikes will come your way.